Jerome Corsi, a journalist known for pushing the Obama “birther” conspiracy theory, suggested on Thursday that he could face prosecution in the Mueller probe. On his daily webcast, Corsi became emotional at times as he cryptically referred to the “extreme mental pressure” he has faced since being subpoenaed by Mueller. Corsi has appeared twice before Mueller’s grand jury. Journalist Jerome Corsi cryptically suggested he could be in legal jeopardy in the Mueller investigation during an at-times emotional appearance on his web show Thursday. Corsi, a former Infowars reporter, has appeared twice before a grand jury being used in the special counsel’s investigation of possible collusion between Donald Trump’s presidential campaign and the Russian government. Special Counsel Robert Mueller, the former FBI director leading the probe, appears interested in Corsi’s interactions with Roger Stone, the longtime Trump confidant who is said to be a target in the investigation. Corsi said that he has been under “extreme mental pressure” since he first became involved in the investigation. “I thought psychologically from time to time I was going to break,” he said. Corsi said Mueller’s team subpoenaed him on Aug. 28 and that he’s been “constantly working with” the special counsel ever since. Corsi has met with prosecutors for numerous interviews and testified to the grand jury in Washington, D.C., on Sept. 21 and Nov. 2. He said he will miss his show Friday because he will be with his attorneys most of the day. He also announced that he will be setting up a legal defense fund next week. Given his reluctance to comment specifically on the Mueller investigation, it is difficult to tell why Corsi could be in legal trouble. He suggested that he could soon be in the national spotlight. “And that’s possibly going to start again,” continued Corsi, who pushed the “birther” conspiracy theory that former President Barack Obama was born in Kenya. Several times through the show, Corsi recited the Bible verse Jeremiah 20:11. “But the Lord is with me as a mighty terrible one; therefore my persecutors shall stumble, and they shall not prevail; they shall be greatly ashamed; for they shall not prosper; their everlasting confusion shall never be forgotten,” Corsi said. Corsi appeared to choke up when discussing a story about a run-in he had with President Donald Trump at the Plaza Hotel in New York City in 1991. Corsi, who said he met Trump three years earlier and knew him socially, recalled how Trump paid for his $1,500 dinner bill after Corsi agreed to change tables at Trump’s request. Corsi said that he spoke during that period with Trump’s father, Fred Trump, and said that he believed the real estate tycoon would be president someday. “I’ve supported Donald Trump actively when he was running for president. I worked with Roger Stone to help get Donald Trump elected,” said Corsi, who added that he has not spoken at length with Trump since 2011. Corsi later added that he had “been honored to know” both Stone and Infowars founder Alex Jones. Corsi was first linked to the Russia investigation after Stone told the House Intelligence Committee on Sept. 26, 2017, that a conversation he had with Corsi was the inspiration for a tweet that has landed Stone in the crosshairs of investigators. “[I]t will soon [be] the Podesta’s time in the barrel,” the Aug. 21, 2016, Stone tweet said. Stone’s critics alleged after the Oct. 7, 2016, WikiLeaks release of Clinton campaign chairman John Podesta’s emails that Stone must have had prior knowledge of the scheme. Stone said his tweet was based on information Corsi provided him regarding the business activities of Podesta and his lobbyist brother Tony Podesta. Corsi wrote on March 5 at Infowars that he and Stone did discuss the Podestas prior to Stone’s now-infamous tweet. 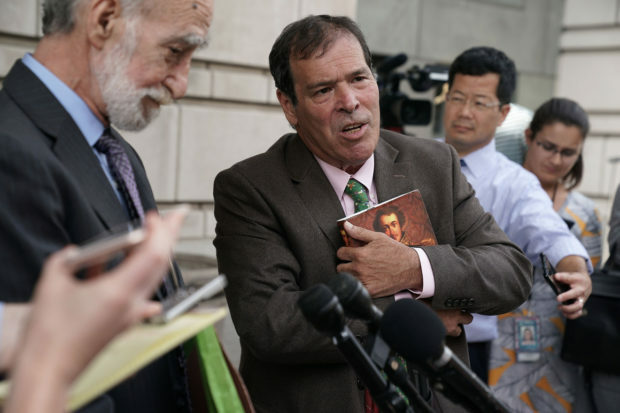 Stone claims he had a link to WikiLeaks and its founder, Julian Assange, through Randy Credico, a left-wing comedian Stone has known for 20 years. Stone has insisted that Credico provided him vague information confirming that WikiLeaks planned to release documents that would “roil” the campaign. Stone says he did not know the content, source or exact timing of the release. The exact nature of Mueller’s interest in Corsi remains unclear, but NBC News reported on Oct. 25 that Mueller’s team had information suggesting that Corsi may have had prior knowledge that Podesta’s emails had been stolen and provided to WikiLeaks. According to the report, Mueller’s team is inquiring whether Corsi told Stone before WikiLeaks released the emails. NBC also reported that Corsi and Stone sent messages to members of the Trump campaign in which they appeared to take credit for the release of the emails. Stone also denied hearing from Corsi about Podesta’s emails or WikiLeaks’ plans. “He never told me that. That’s new news. He never sent me anything of the kind,” Stone told The Daily Caller News Foundation. Tweets that Corsi sent just days before WikiLeaks released Podesta’s emails suggest that he did not have details of the contents of the leak. Corsi sent the tweet just ahead of a press conference where Assange was to make a major announcement regarding the release of documents he had been teasing for weeks. Assange held the press conference but did not release documents or provide details about what would be released. Corsi has also denied meeting with Assange. Corsi offered harsh words for Mueller and the investigation in that web show, which was aired three days after Corsi was first subpoenaed. He accused Mueller of being part of a “criminal coup d’etat” and reacted to Stone’s claim that he could be indicted in the investigation.